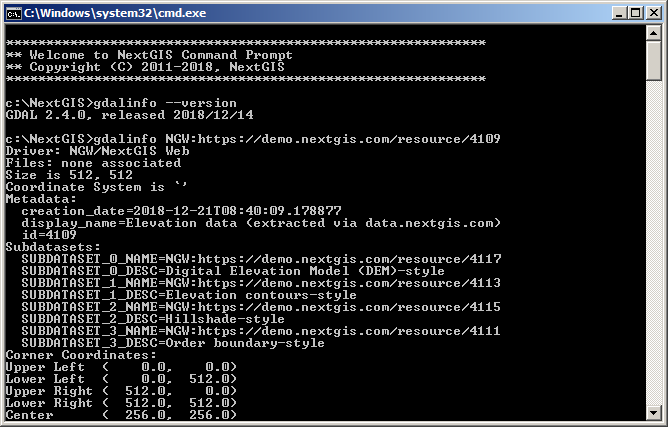 Geographic data abstraction library GDAL/OGR has got a new very important driver – NextGIS Web. The new driver is available starting GDAL 2.4. NextGIS Web (NGW) – is a server GIS, our main product that allows to organize storage, visualization and management of your team’s geodata. NGW is used by thousands of users around the world in our nextgis.com cloud and lots of different organizations on their premises. New GDAl is already used in NextGIS QGIS available for Mac OS, Ubuntu and Windows. Get information about NGW resources: vector, raster layers, styles, services. More of NGW support on GDAL website. More of NGW raster support on GDAL website. There is a LNK2019 error when compiled with GDAL/OGR library. Building GDAL-2.4.0 on Windows10 platform using nmake generates the same LNK2019 error. I am using the Visual Studio 2017 Developer Command Prompt. Any ideas as to what has gone wrong? Nothing was modified. This is subject for issue at https://github.com/OSGeo/gdal/issues. But before creating the issue, please check your build environment and you have cleaned all previous builds artifacts. As I see at appveyor (https://ci.appveyor.com/project/OSGeo/gdal) builds on Windows including NGW driver and it unittests passed fine. I’ve done a bit more digging and it seems that ogr/ogrsf_frmts/ngw is not being built and ogrngwdriver.cpp holds the RegisterOGRNGW() function. This could just be a makefile issue but I’m not sure how to fix it. Could you let me know how to best fix this issue?